A couple of weeks ago, I organized a little crochet work shop for some mothers of children that attend the same class as my oldest daughter. It was just for fun, nothing didactic, because I don't have any teaching skills at all. We made market bags and they all liked it so much, that they wanted a follow up. 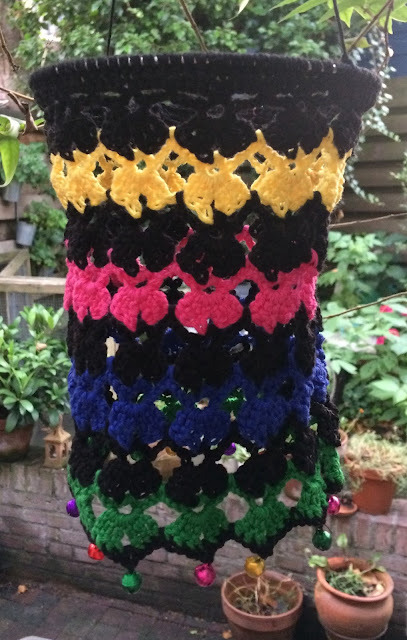 We sat in my garden and from the pergola hang a couple of crochet lanterns they saw and that lanterns were what they wanted to make next time. So last week I organized another work shop and this time we made little lanterns. And because I was a bit tired of looking at my own lanterns I crocheted along with them and made these lanterns. 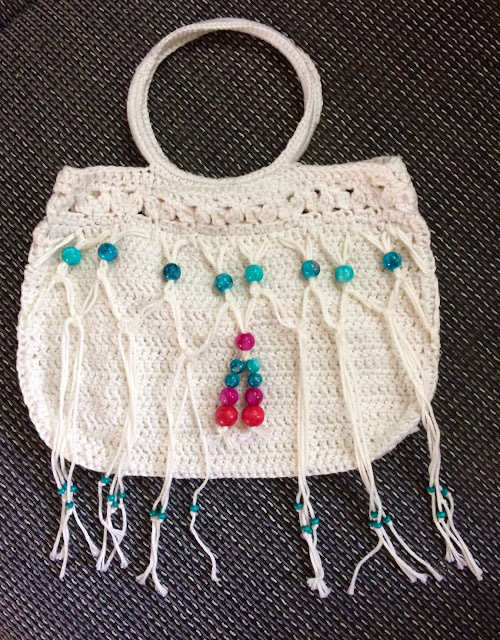 It's a while ago I made a mochila. Since november, when I made the last one for my friend's birthday, I didn't feel like crocheting mochilas anymore. But on Pinterest I saw this beautiful, beautiful Peacock Feathers Pattern and suddenly the feeling was back: I had to make that one! 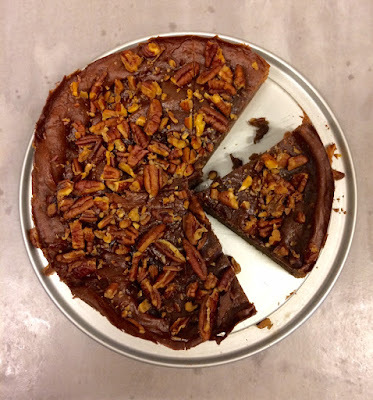 Last week I told you about the Poke Cakes I see pop up everywhere in the blog world, so I wanted to try it for myself and used this recipe for it. The cake was great, so I'm definitely going to move this recipe to the 'Recipes to keep'-board on my Pinterest account. Excellent taste with little effort. Love that! My youngest daughter really, really loves to cook. She only seven, but likes to choose recipes by herself, do the grocery shopping (I'm only allowed there to carry the bags afterwards) and prepare everything herself. Well, I think she is a bit too young to operate the stove, so a little help from my side is desirable. Next week is the last week of school before summer holidays finally start, so this week my daughters and I were busy making gifts for their teachers. The class parent ordered all children to make paper flowers and to write compliments on it for the teachers, so she can put them all together and make a garland of it. We made the Calla Lilies, as showed earlier this week. But of course my daughters also wanted to give something of their own. 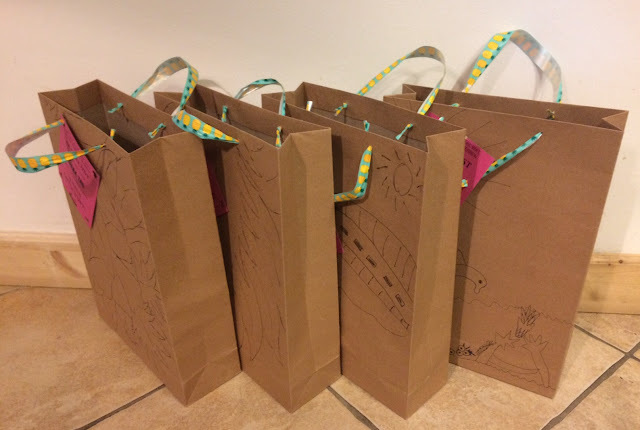 I bought paper bags that my daughters could write and draw on and filled them with some relaxing summery stuff. My oldest daughter will turn ten in just a couple of weeks, but before it's her turn, all her friends will have birthdays first. 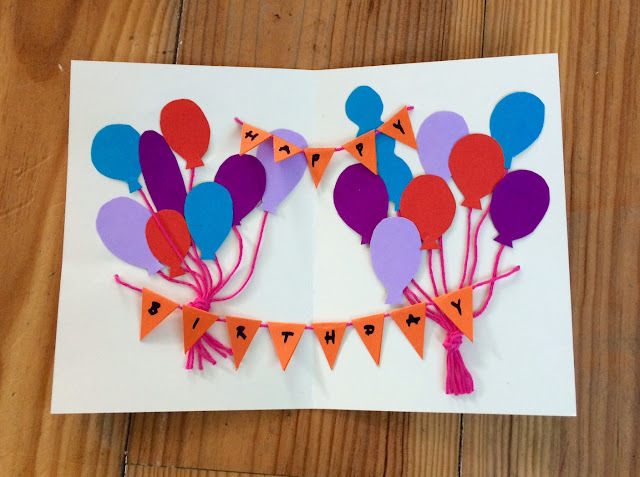 So today I made a birthday card for her friend. My Beach Bracelets were featured by Creative Jewish Mom and by My Husband Has Too Many Hobbies this week! Thank you, Sara and Laurie! The Compliments Bouquet was featured by A Mama's Tale! Thank you very much, Brittany! Last week I chose those Pretzels to make, so here they are! As you can see mine more look like little bread rolls that happen to look a bit like pretzels. They tasted excellent, though. We dipped them in olive oil with a bit of salt and pepper and they were gone in now time. Luckily I put two of them in the freezer, so my daughters could take them to school the next day, for lunch. They stole the show, so they said, so this recipe is to be repeated! 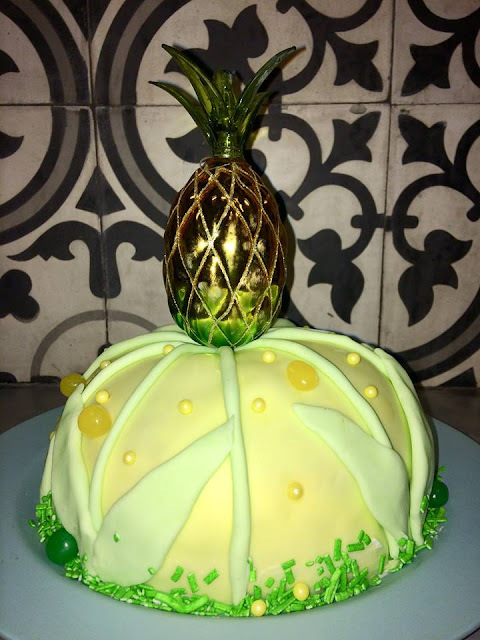 I read about poke cakes all the time lately, so I thought it's about time to make one myself. I thought about a Strawberry Cheesecake version. 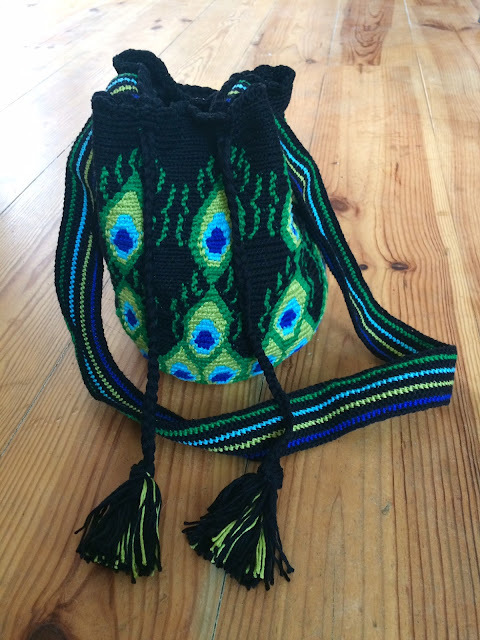 Months ago I made this little Boho Bag, I only had to attach the fringes before it was finished. And that's my core problem: I start lots of projects and as the end nears I get bored and want to start something new. Some projects I just never finish. Actually, that's the reason I started this blog in the first place. 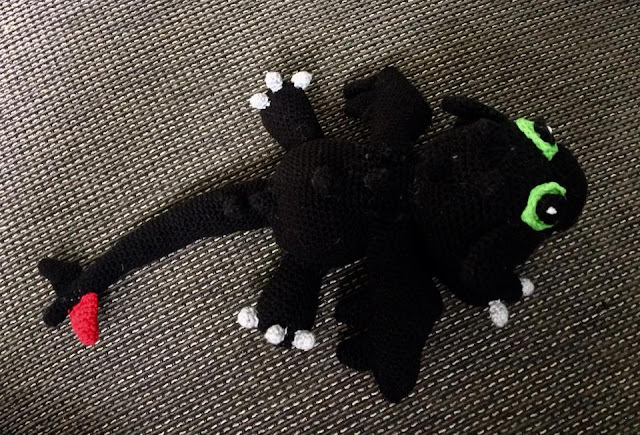 I can't show you half finished crocheted projects, or just the batter but not the whole cake, or cut out fabrics but not the clothes, so starting this blog was to force myself to go on until something is completed, because I want to post the things I make twice a week. But still every once in a while a project is set aside because it takes too much to time to finish it before my own set deadline (no, I put no pressure at all on my own shoulders, that's so not me) and as soon as it's out of sight for a while for some reason I just can't bear it to take it up again to finish it. So I start something new then. Together with summer the end of the school year is approaching. At the school my daughters attend, it's not only customary to give a present as a class, but also as individuals. My daughter and I have crafted a compliment bouquet today. 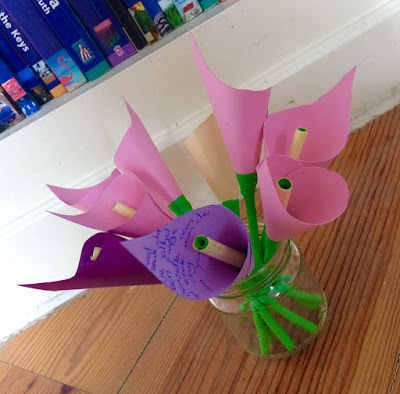 We made a couple of Calla Lillies (Zantedeschia) and my daughter wrote compliments in the inside of the flowers for all three teachers. I just saw that the City Gym Shorts that I posted a while ago, was featured by Strawberry Butterscotch! My Unicorn Pendant and my Bunny Basket were both featured by Creative Jewish Mom! The Unicorn was also featured by Sum of Their Stories! Last week I let you know that I would like to make one of these Avocado Desserts. I chose to make the brownies. It's not totally vegan, because there's eggs in it, but I'm not a vegan anyway, just a vegetarian who wants to lose a pound or four, so I thought it would be worth a try. Actually the avocado brownies more look than taste like brownies, but they were good anyway. To add more taste I sprinkled a lot of pecans on top. Instead of sugar the recipe uses honey. Maybe you don't know this (I didn't), but there's more calories in honey than in sugar, but because honey is a bit more sweet, you don't need as much to get the same sweetness. In this recipe I think the amount of calories is almost the same for sugar or honey. 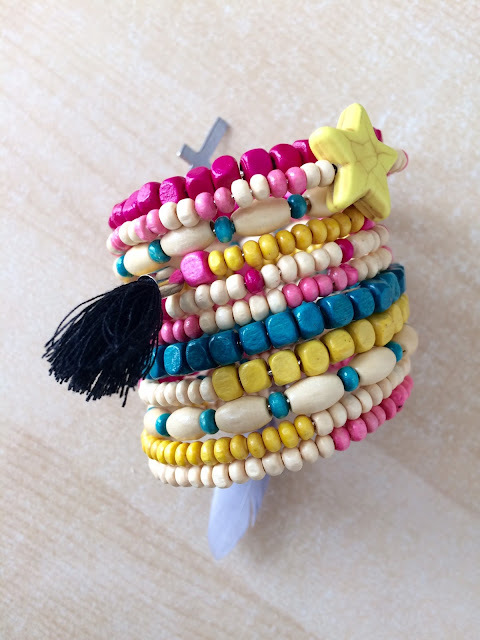 Summer is coming, so I made some beach bracelets! 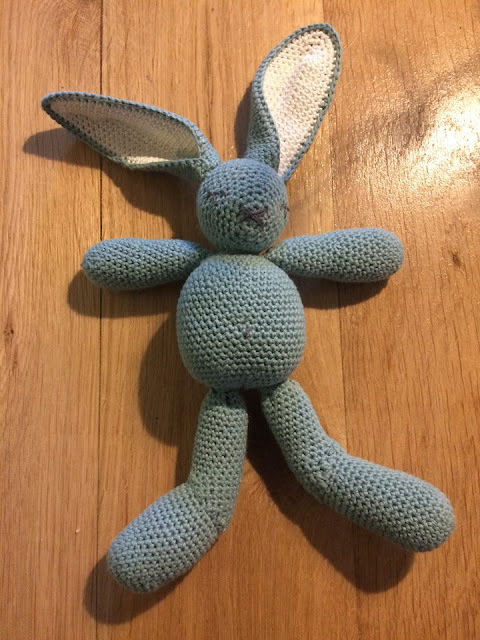 Maybe you remember I told you I gave a little crochet workshop for a couple of mothers I sometimes meet at the schoolyard while I'm waiting for my daughters. I gave them two simple projects to choose from, a market bag or a little basket, and I made an example of both. They all chose the bag (which I actually prefered, too), which most of the mothers have finished by now. 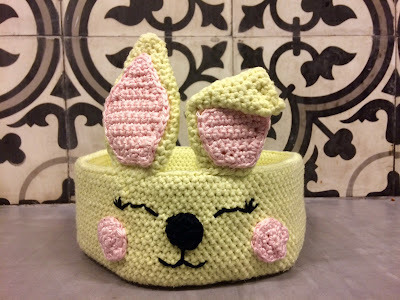 I'm not into small crocheted baskets that much, so I embellished it a bit, until it looked like a bunny, and gave it to my youngest daughter. The Crochet Club, as one of the school mothers named our little get together a couple of weeks ago, when they want to learn how to crochet, was sort of a success. 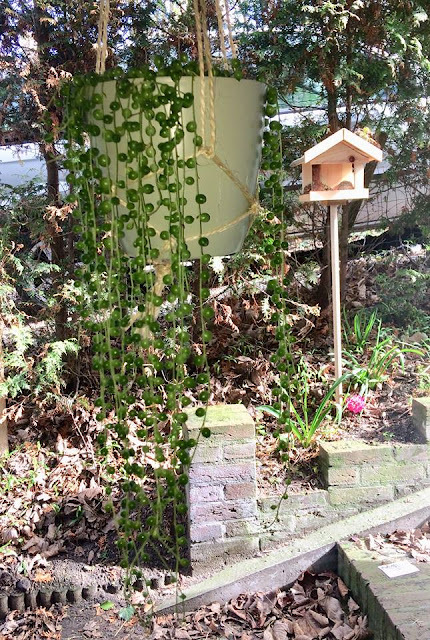 All mothers asked for a continuation and have already chosen what they want to make next time: the Crocheted Lanterns I made a while ago, which they saw hanging from the pergola in my garden. So, in a couple of weeks they will gather at my house again! Great!